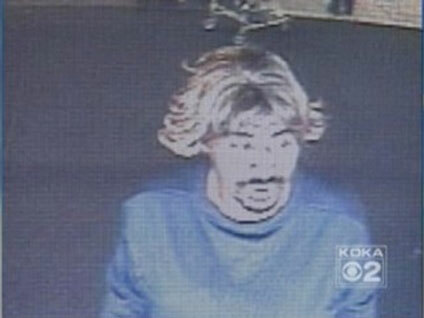 SWISSVALE, Pa. (CBS/KDKA) A Pittsburgh man wearing a blond wig, fake breasts, and clown pants was arrested after he allegedly robbed a bank at gunpoint. Swissvale police chief, Greg Geppert, said Dennis Hawkins, 48, shoplifted a BB gun from a local Kmart, and then used it during the heist. The suspect allegedly fled the bank with an undisclosed amount of money. Shortly after police were called to investigate the robbery, they received a tip from a nearby gas station that a man fitting the description was attempting to steal a car, reports CBS affiliate KDKA. Hawkins, apparently covered in red dye from an exploding dye pack, allegedly entered a woman's parked car. She quickly got out of the vehicle, took her keys, and alerted authorities. Police arrived at the gas station to find Hawkins still sitting inside the vehicle. "He would get my nomination for dumbest criminal, I think. Yeah, definitely different," said Swissvale Police Chief Greg Geppert, according to KDKA. "I mean, with the wig on, you still have his black facial hair with a blondish wig, definitely different." The bandit with unique fashion sense is now being held on $230,000 bail.